System Volume – Display Tank (6ft long standard 125 gallon), Remote Sump – custom built plywood sump holding approx. 60 gallons. Lighting – 6x80 watt LET retro t5, with a diy LED bar down the middle for some shimmer and sunrise/sunset/moonlighting. Barr Aquatic Systems 2-stage Calcium Reactor fed off return manifold, controlled with a kamoer continuous duty dosing pump. Tank is driven by a Reef Angel Plus. Mostly SPS, a few named pieces, (Myagi Tort, PC Rainbow, brand new – Fox Flame, Palletta Pink Tip, couple others I forgot…), a few nice random pieces from a “Battle Box”, before they were really called that, and about 5 pieces from Big E here on RC. He has great stuff by the way if he puts up another for sale thread. Very professional as well. There is also a youth football sized pocillipora colony in there that I would get rid of if the wife didn’t love it. To be honest, she has a point. It adds some nice structure to the tank, especially until the acros grow in. A few LPS including some acans, a large 150+ head Duncan colony, and a smaller 40ish head colony, a 6ish head frogspawn that was on my original coral order (somehow managed not to kill it and for the first time, it’s finally growing), a purple gorgonian, a zoa colony etc. A few other random inverts including 2 captive bred pincushion urchins, a feather duster, and a few hundred vermetid snails (yay…). Some pics of my current setup are included. This is the 125 as of about 3 weeks ago. 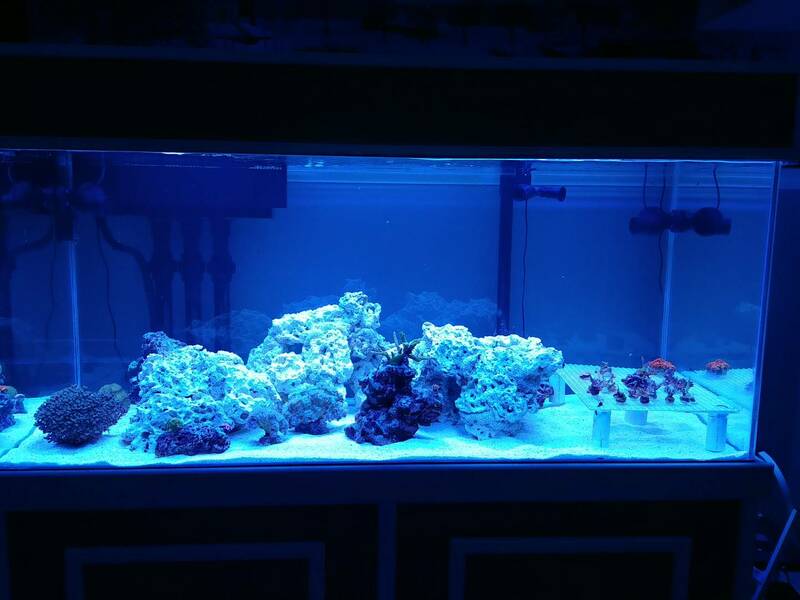 I am terrible at taking pictures of my tank, so hopefully someone has some good advice for me… Yes I had some cyano issues which I partially resolved by changing out half the sand bed. Next half to come in a few weeks once it settles in again. Please excuse the mess. One of the goals of the new system will be to have everything tidier. Last edited by pisanoal; 09/11/2018 at 01:00 PM. A few sump and Refugium/recovery tank photos. Now on to the good stuff… the Upgrade! So about a month ago, I started thinking about possible upgrade solutions. The main reason being for the now Juvenile Clown Tang, whose name is Annyeong (after the Korean boy in Arrested Development). Since this upgrade is mainly to provide him the room he will need as he grows, the build thread is named for him. A quick aside, I bought him from my usual LFS who insisted I could keep him in a 125 for years before he would need an upgrade. When he got too big I could trade him back in. That won’t work now as he is our favorite fish… Also, he starting to get a little pushy with a few of the others, not mean, he will just push them with his body to one side of the tank or to the bottom on occasion. 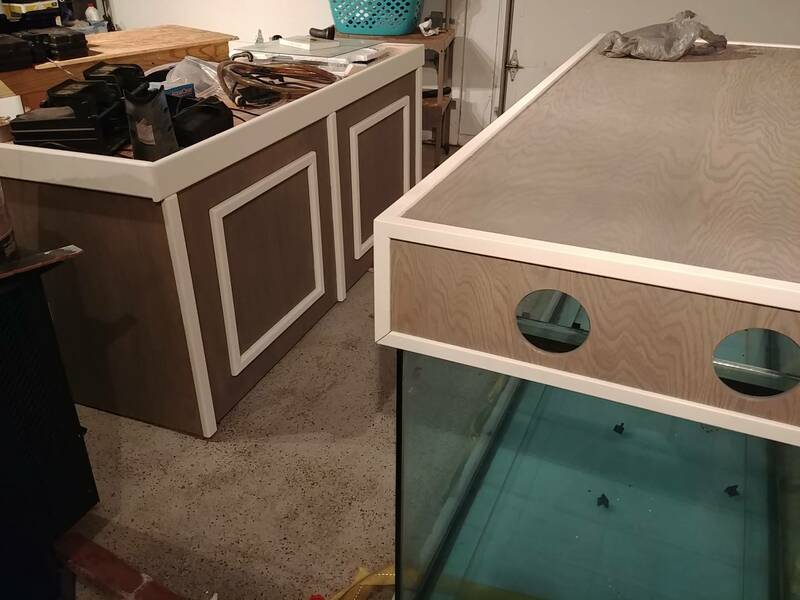 When I was thinking about upgrading, I was considering doing a plywood build because large tanks are so darn expensive… Especially the deep dimension tanks as you either need to go custom or marineland. My one big complaint about my 125 is the depth… not a lot of room to get super creative on aquascaping. I decided I would plan the build and keep an eye out for a good deal on craigslist, but I didn’t expect to do this build for at least 6 months to a year from now. 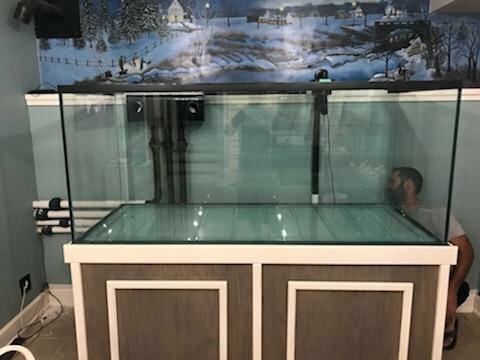 However, I stumbled across a pretty epic find on craigslist in the form of a brand new, still in factory plastic, custom glass cages 72”L x 30”D x 31”H aquarium and oak stand just 2 hours away. There were some sketchy details in my interactions as it was being sold through someone that was not the tank owner. But it ended up being in a guys shed who had passed away, house had sold, and the new owner wanted it gone. So I picked up the tank and unfinished oak stand for $750. The tank is ½” glass, eurobraced, undrilled. The only thing I wish it had is a low-iron glass front panel. But for such a good deal, it’s hard to complain. Also, I’m not coming from a starfire aquarium, so I don’t really “know” what I’m missing. I plan to keep this a low cost upgrade, budgeting around $600 to get it up and running with the improvements I really want to make. I’m trying not to buy anything that has to be upgraded or changed later. If it has to be bought now, I’m getting what I think I will want in the long run. The few things that fall into that list are the overflow, the lighting, and the rockwork. For the overflow, I plan on going with the modular marine 2400 gph slim overflow. I’ll have a beananimal setup in the back. I plan to reuse my current lighting, with the exception of either adding one more set of T5’s or going with LED bars. 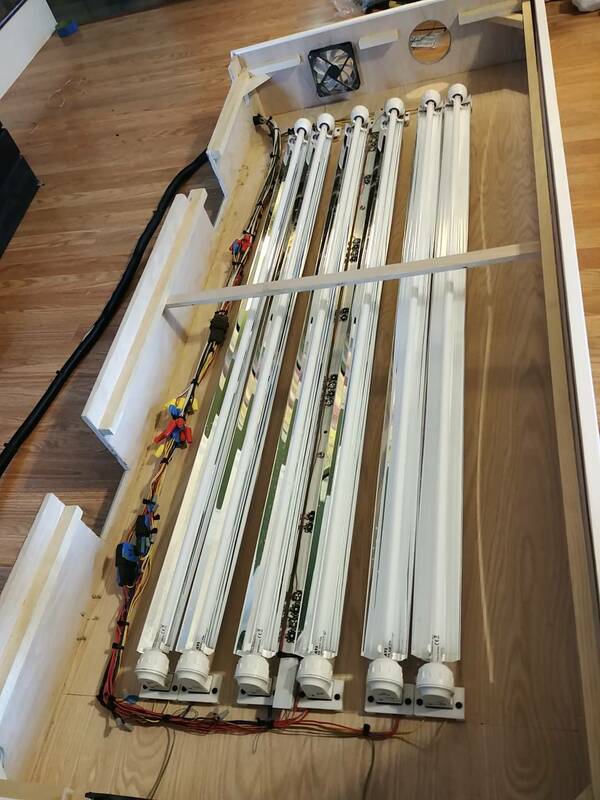 I am leaning towards LEDs, and found some pretty inexpensive ones on Ebay that my LFS uses on his ATI fixtures and really seems to like. He recommended I change out some of the blue diodes for some violets but otherwise he really likes them and they run about 50$ + the new diodes and a little soldering. To get the system up and running, I’ll probably leave space for these, and purchase them later. For the rock work, I was planning on making my own utilizing my old sand and some white Portland cement. 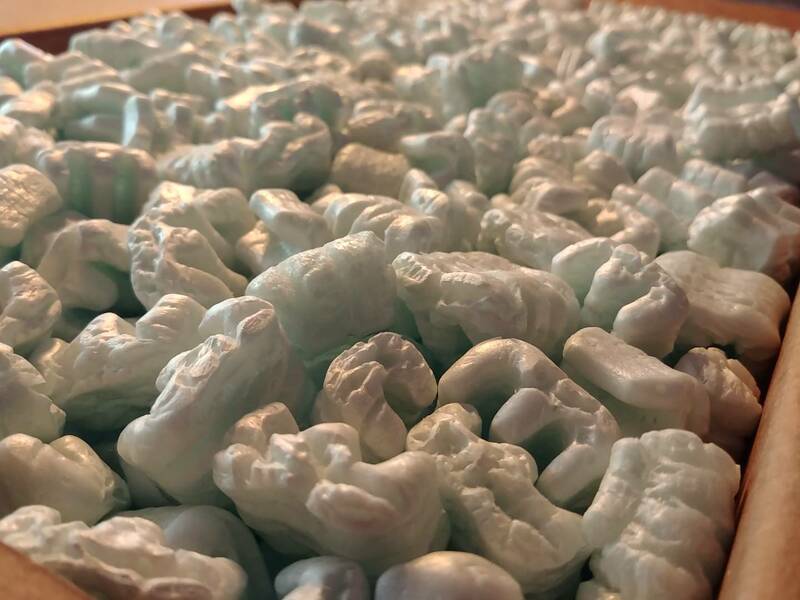 However, my first attempt at this made me realize that for one thing, it was going to be hard to make realistic looking rock, and for another it wasn’t going to save me a whole lot of money as I was going to need 2 more large bags of aragonite sand. Our second attempt came out much better, but there are still some concerns on durability and curing length. So tried and true florida mined dry rock it is. I plan on removing my two main structures, acid cleaning them and building off of them using the pond foam/epoxy/sand method which has worked out great in the past. One other concern I have with this upgrade is the size of my skimmer. I know it will be small for a system this size. However, I don’t plan on adding many more fish, as I don’t want to have any aggression issues with Annyeong. So I might add a larger group of anthias, or some more dartfish but that’s probably it for a while. Enough typing for now, here are some pics of the new tank and stand. Stand is to the left of the picture with the dog(for scale), not the dinky table right behind it. I just realized I didn't take any dedicated pictures of the stand yet. So with this upgrade, we decided to rethink our strategy for the “tank room”. Our house is a split level, and the tank is on the lowest level, adjacent to our 2 car garage, where the sump, controller, etc all sit. The room is about 25’ long and around 10’ wide, and the tank currently sits at the far end of the room. There was a pellet stove sitting in the back left hand corner. It was up on a pedestal, and the current tank just barely fit between the pedestal and the wall. The new tank would fit as well, but we decided to yank the pellet stove out as the room gets too hot when it’s on anyways and the new tank will be centered on the back wall. With the old setup, you “can” view down the length of the tank through the left side panel, but it required squeezing between the stove and the stand. The new setup will allow side views on both sides. Also, better for tank maintenance. The other major issue is that the last row of tile underneath the old tank is just barely a partial. So the old tank will have to come out for a few days while I do the tile work. That means a tear down and temporary setup. This is sort of a blessing in disguise as it means setup day won’t be crazy stressful on tearing the old tank down, moving it out, setting up the new tank and getting it filled all in a day. Only concern is temporary lighting. I was a bit worried when I read 1/2 inch glass on a tank that size and height.. I was happy to see the cross bracing on top. Should be a very nice system! Thanks! Yeah I dont really know a whole lot about larger tank construction. I checked their website and they have several of their standard builds close to that size or larger using 1/2". The bracing is pretty beefy and there is some extra bracing around the inside bottom to reinforce that seam. Slow on the updates, just got through our major maintenance outage at work. Lots of 12 hour days and not a lot of energy to do much on the upgrade when i get home. Right before the outage, I found out that i was out of luck on matching the tile. I removed the same tile from the washer/dryer closet and amazingly didnt break a single tile! I attached a picture of my process which included grinding the grout out with an angle grinder (aka making a gigantic mess that was mildly contained by plastic), pouring dilute hydrochloric acid between the tiles amd letting it sit, the pounding a scraper blade underneath the tile. This turned out to be very effective, and surprisingly little effort aside from the grinding. The end result is literally just enough tile to get the job done! Woohoo! I also put a fresh coat of white paint in the closet, removed a bunch of junk from the shelves, cut a cat door in our bifold doors since thats where the litter box is, and remounted them (they have been off for a while). All in all, pretty productive "side project". ...painting and staining the stand! Well I got home yesterday afternoon to find my overflow on my doorstep! 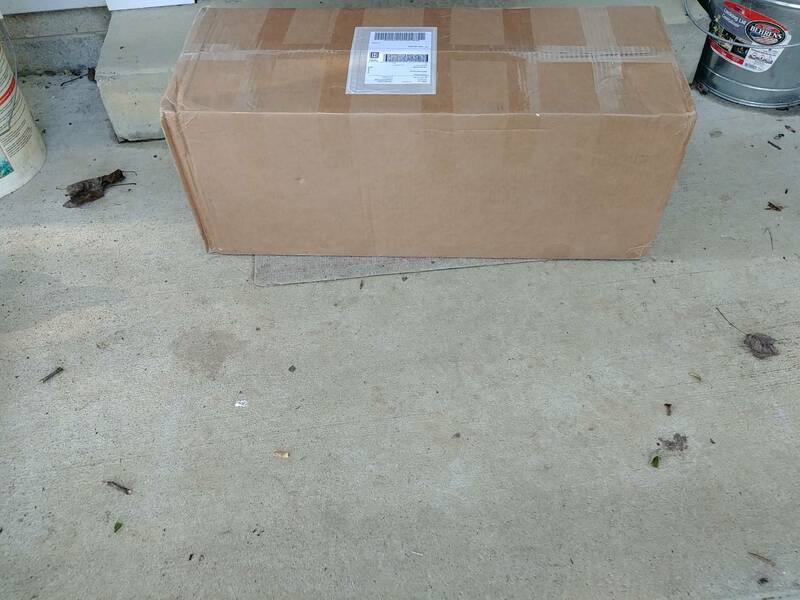 A few unboxing photos. I will be drilling the tank t his weekend! Thanks! We are really happy with the colors we chose. It will be nice to have the stand compliment the room instead of being a bit of an eyesore like my current stand. I got the tank drilled last night! Overflow is installed temporarily for the leak test. One issue I may have is the water height. I had to put the overflow a little lower than i wanted due to the beefy cross bracing and i dont think my canopy will cover low enough down the tank. May need some modification. Water going in for leak test! A lot has happened over the past weekend! My goal is to get this thing installed this weekend, but i have a decent laundry list of things to get done before that. 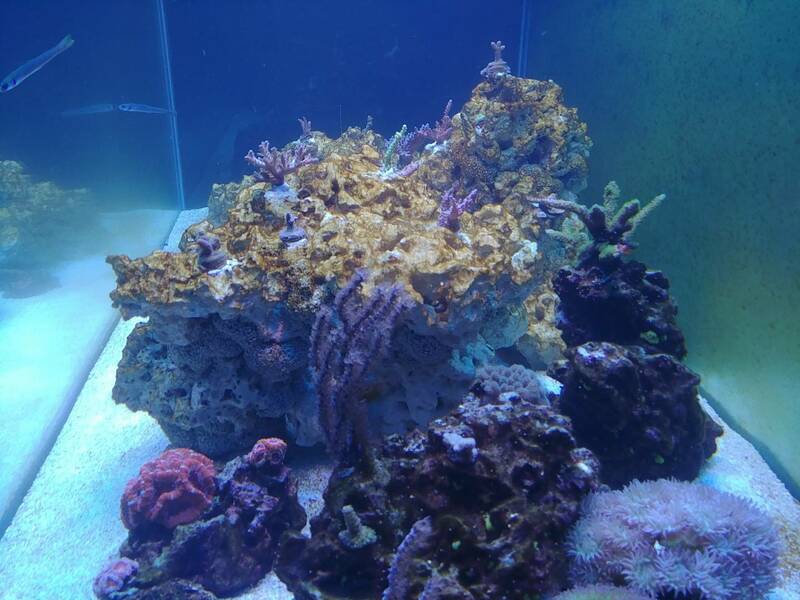 - Removed the coral from the main two rock structures, acid cleaned the rock and foamed together the new aquascaping (pictures - arrangement is close but not exact to what it will be in the tank, still one more smaller structure to come). The goal for the aquascaping was minimalist with lots of hiding places for fish. I have some aggression issues right now (not with the clown tang luckily), so I'm hoping that will help a lot. - Cut the new trim for the corner. - Rinse the new sand. I'm going all TE Reef flakes, a little more than half of my current sand bed is reef flakes, so that will be moved over after being rinsed. - Move LED's from current tank and mount them in new canopy. These are purely aesthetic so no harm in moving them early. - After moving the stand, break up 3 remaining partial tile, and lay new. - Move lighting over from old canopy to new (big project). I'll be remotely mounting the ballasts and power supplies inside the stand. All that should be left Sunday is to move the new tank in. 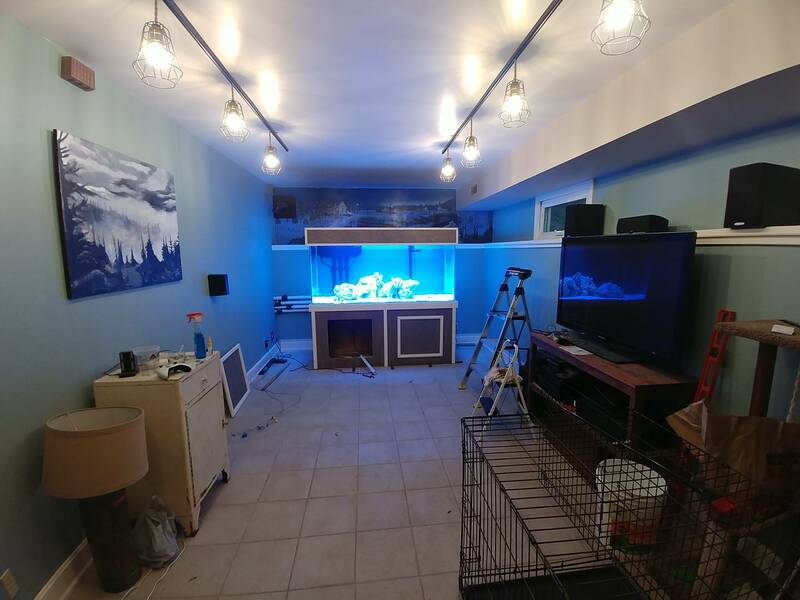 Then ill have to match up to my current plumbing that goes out to my garage, and all the other associated tasks of transferring materials and livestock to a new tank. Piece of cake! Its a bit overwhelming, but I'm excited about it. This is all provided I can get enough help moving the tank in. So a whirlwind weekend resulted in a successful tank move in. Install day got bumped up to Saturday due to help availability. Luckily I was able to take half a day off of work on Thursday and Friday. Thursday i was able to get the 125 broken down. We moved it out into my already packed garage, and I removed the 3 remaining tile and installed the new. I also had a bit of an issue getting the alkalinity of my new salt mix down low enough. I was mixing up about 250 gallons of fresh salt water and had to add more muriatic acid on Thursday. I was worried about the pH coming back up in time for thw install so added some more agitation/aeration. A few crappy pics of the 125 being broken down and the new tile in place. We didnt take that many due to the day being so packed. Friday we touched up the paint behind the tank, tore out the plumbing, grouted the tile, painted the new trim, and installed the new trim. I feel like there was more than that because it was a full day for sure. Saturday morning I installed the new return plumbing up to the union before it makes a 90 to the top of the tank. I also did some cord management which came out a lot better than what it was previously. I also cleaned the inside and outside of the new tank in preparation for the install in the afternoon, and removed a bunch of the junk from the garage trying to make more room. So I'm fortunate my wife has a large and friendly family, as they all came over to help us. We had 6 people lifting the tank, and slid a large cart that I had built for my QT tanks underneath it. This made getting it into the house easy. Having leveled the stand earlier, we rolled the tank up to the stand and had 4 people on suction cups on the end of the tank to set it on the stand. We did some final leveling on the tank before all the muscle left and got everything squared up and situated. Then i started work on matching up the plumbing to the overflow and return. We started filling around 5pm after setting the rocks and sand in. The tank was too deep to set the heavy structures in from a ladder, so I climbed in... Pictures below. By the end of the day i had water recirculating through the whole system. Had one significant leak on a union that i got fixed, and have a very slow weep from one of the bulkheads on the tank. I need to support the overflow piping a little better I'm sure. Its slow enough that im not terribly worried yet. Next step was to get the lighting installed on the new canopy. There was some time pressure here as the coral have been without lights for 3.5 days. That all went surprisingly well, and i had lights on the tank mid day Sunday. Name of the game here was neat and orderly. I think it came out pretty well! With the lights on, i got all the coral in the tank. Most of the old rock will come back out once things settle back down. Wow! Nice family, nice work!! Yeah, it was great. Had 9 people show up for the big move. A friend from work who I got hooked on the hobby with an old setup of mine helped a bunch with the plumbing and filling, etc. It was a very satisfying weekend and it feels great to be able to sit by the tank and enjoy it. It really dominates the room in a great way, very different then how the old setup did. I lost one acro in the move so far, hopefully no others. It was a JF fox flame frag i got from a local reefer. Didn't look great when i got it, and never settled in to my tank. Was on the way out before the transfer. A few others dont look great, but nothing in dire straights yet. I finally got all my powerheads in the tank, 4 tunze 6065's. I placed them in th upper 4 corners and have the angles so they are blowing across the 3 major rock structures. It should great some nice turbulence where I need it most, and some great randomness as the sea swirl oscillates back and forth across that alsame area with about 1200 gph, but im concerned because I'm only at a quote 6800 gph (without return). Which doesn't give me very much turn over rate. I did pick up another to place on the back wall that I'll angle towards the front right corner, so that will give me 30x tank volume. I know the flow numbers are just guidelines, but I'm way under the "number" for sps dominant. Any thoughts on this? I think I'll be fine because I'll have tons of turbulent flow over the "reef crest" maybe not so much on the edges, but that should give a nice haven for some sps. I know thr 6065s are small for the tank size, but I really like that they move water the full 6 feet, and with good velocity at the far end. This gives me great randomness when the many smaller pumps interact in the middle of the tank. I definitely wont be moving to any bigger tunze's anytime soon as they get outrageously expensive. Anyways, here is a the view with the room mostly back together. I got my acros all placed, and the "final" scape done on Sunday. Also have quite the diatom bloom going on, most of my cuc is still in the sump so that's still on the list. Few pictures of the tank and the 3 fish that are in there right now. My original plan for a skimmer was to use my old sca 301 that i had on my 125 until i upped my stocking, but i can across a good deal on a used lifereef 30" so I jumped on that. It came in the mail today. I must say, I as a little disappointed, this is the 2nd piece of used equipment i bought off here in the past couple of months and both looked like they were taken out of the tank and not touched at all. The skimmer had 1/4" of gunk about 2" down the body and in the neck. Does nobody clean their equipment before selling anymore? I understand not deep cleaning it, but at least rinse it off. I like to sell my stuff ready to use out of respect for my gear and the buyer. Anyways, looks like its in good shape apart from the base chipping during shipping. Still fully functional, and easily repaired. I'm away for work this week, so its soaking in a vinegar until i get back. Looks good! You may want to get some snails in there to clean up the brown before it becomes some raging algea mess.